When you're writing copy for your website and marketing materials, proofreading your content may be the last thing on your mind – particularly if you're on a deadline. But paying more attention to the words you're using could help to maintain and improve the perception people have of your business. Spelling mistakes, grammatical errors and poorly-constructed sentences can make your business look unprofessional, which will only encourage your potential customers to look for other - more professional - companies to spend their money with. Mistakes can also cost you money. Business owners sometimes waste whole print runs because of bad spelling, punctuation or grammar that spellcheck didn't pick up. 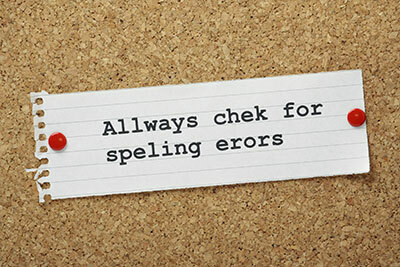 Mistakes can be more easily and cheaply rectified on a web page – but only if you spot them! Here are some handy tricks that professional proofreaders use, which should help you pick up errors before your customers do. If you're using a computer, use spellcheck but DON'T RELY ON IT! Spacing between words – are there any spaces missing or are there too many? No need for double punctuation e.g. !! Perhaps you don't always need to use commas, full stops, colons etc. to make sentences clear. When I am in a hurry, tired, cold or lazy I sometimes leave out punctuation marks. "Grammar is stupid! I can write without it and don't need it," my uncle Harry once said. He was not very clever and I never understood a word he wrote to me. I think I'll learn some punctuation - not too much, enough to write to Uncle Harry. He needs some help! Get in touch if your marketing copy could do with the once-over from our eagle-eyed team of proofreaders!